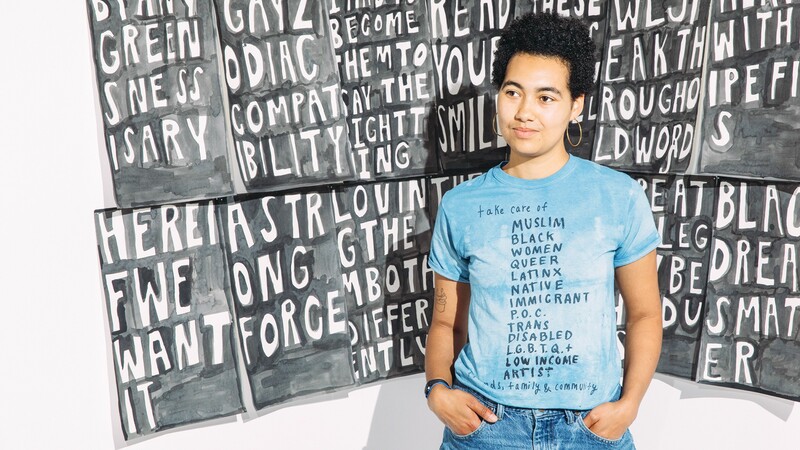 The Oakland artist and activist works to prioritize fellow queer people of color. On white, poster-sized recycled cardboard in Lukaza Branfman-Verissimo's living room, her handwritten words are rendered in thick, black Sharpie: "We must imagine a world without borders, ICE, police, prisons." The Oakland artist, activist, and storyteller, assuredly self-described as "a queer, Jewish-American, African-Brazilian woman," says it was made for the present moment and inspired by a Pride Week photo she saw on Instagram. "It was so beautiful... What does it mean to imagine a future world that can support a queer person? Can we imagine a world where folks in communities that are being ignored are put first?" Branfman-Verissimo is celebrated for her mixed-media artwork that carries in-your-face, written reminders that language is a precious gift; that artists who are women, people of color, queer, or non-binary do not have skin color or gender to look past but vital ancestry to look directly into. The goal of her potent words and raw imagery is not to inspire awe, rather wonder, imagination, engagement, and activation. Branfman-Verissimo earned a BFA from California College of the Arts. Her work has been included in galleries in New York City and Los Angeles, as well as in Bay Area venues such as San Francisco Museum of Modern Art, Kala Art Institute, and Berkeley Art Museum and Pacific Film Archive. In Oakland, she is co-founder and lead curator at Nook Gallery and a member of the CTRL+SHFT Collective. In her practice and as a curator, she focuses on promoting fellow queer people of color. "It's important to talk about communities whose stories aren't archived or told in day-to-day lives," she said. "It's still a problem of who we're prioritizing. Turn on the news — we're putting white voices of privilege first." Born in New York City and raised in Los Angeles in environments where "art-making was a natural part of every day," Branfman-Verissimo moved to Oakland for its history of social justice and community activism. Art intermingled with activism nurtured Branfman-Verissimo early on. In a box stored in her parents' home, she recently found a Santa Monica Daily Press front-page article about a protest against the Iraq War she organized in elementary school. "I was super shy, so they interviewed my mom," Branfman-Verissimo said. "She said the revolution is for every age." As with that elementary school march, Branfman-Verissimo continues to take her art, words, and imagination into the streets — not just galleries and museums — in an effort to create a less oppressive world. "In my mind, I think, 'less imagining, more doing,' but in imagining, I am doing. Even by having this conversation, I'm putting our minds into a place of thinking about how we can make it happen," she said. "What conversations can this spur?" Her work has already sparked tangible results. In reaction to the 2016 presidential election, she created a hashtag, #takecareof, and drew it on a T-shirt as a work of art. The hashtag — designed to inspire folks to take care of their marginalized neighbors who would soon be under attack with the new administration — blew up on social media, resulting in Branfman-Verissimo screen-printing 300 T-shirts, posters, and banners for supporters. "I wanted to make #takecareof beneficial," she said. "We have to be really responsible in how we use social platforms, but it's a resource if we use it consciously with thought."